South Perth Stories has launched! South Perth Stories is an online collection that aims to capture and preserve the history of our dynamic city through the stories and experiences of residents and visitors, past and present. It encompasses stories recorded and stored in the City’s Oral History Collection, stories recorded in early 2016 during The Bench Talk Project, and stories collected throughout 2016 on South Perth Storycards. Stories recorded as part of the Oral History Collection are also available for three-week loan periods at the South Perth Libraries. Visit the ‘Local History‘ area of the South Perth Library to browse through the many stories available. Or search for “South Perth Stories” on the Library’s Catalogue online to browse through a list of the interviews and reserve a copy. The collection of South Perth Stories will continue to grow over the coming months and years as we continue work to digitise and catalogue the recordings in the City’s Oral History Collection, as well as record new stories. If you have a story to tell about living or working in the City of South Perth, contact the City’s Local History Librarian at the South Perth Library on 9474-0800 or email localhistory@southperth.wa.gov.au to arrange for your story to be recorded. If you love telling or hearing stories about South Perth, you’re not alone! Earlier this year, we launched The Bench Talk Project as a way of doing just that. Our bright blue bench has been appearing at various events around South Perth this summer and inviting people to sit and tell us a story about their connection to our local area. At the end of the project, the stories will become a part of the collective memory of the South Perth area and all the stories collected will be shared on a newly launched website called South Perth Stories which is due to launch during the second half of 2016. So follow the bench to one of our next events (see below) and take a seat and tell us a story about the olden days in South Perth… or about what you love to get up to in your neighbourhood and what makes it so special… or whatever else comes to mind! Visit The Bench Talk Project webpage to find out about and book in to the storytelling workshops that the City of South Perth Libraries are hosting as part of this project to teach and inspire you to gather your own stories. This year will be all about stories. The City of South Perth has launched its new Arts & Events Programme, A Story to Tell, and we are kicking off the year in local history with our latest event, The Power of Family Stories. The event will start us off thinking about oral history (we will explain what it is for those who don’t know!) and why it is important, as well as giving us a few tips and tricks for how we can go about recording our own family’s history. Our two guest speakers, John Bannister and Janine Boreland, have extensive experience in capturing stories and have worked on a long list of varied projects over the years. This talk is the first of a number of events and workshops that are taking place under the storytelling series, The Bench Talk Project. For more information visit The Bench Talk Project page. Founded in August 1895, the Royal Perth Golf Club has a long and proud history which began when the Club commenced on Burswood Island before moving to Wattle Grove Farm, Belmont in 1900 and then to its current site in South Perth in 1908. In May 2015, the City of South Perth and the Royal Perth Golf Club began working together to digitise historic photographs and ephemera from the Golf Club’s own archive collection and to record oral histories with some of the Club’s long-standing members. Over 100 images were scanned and catalogued and five oral history interviews were recorded with members and past presidents capturing the spirit and stories of the Club. Visit Picture South Perth to view the Royal Perth Golf Club collection online. As any member of the club today will say, the real pride of the club lies in its members and their stories, in the friendships and sportsmanship that can only truly develop from a love of the game and a course that feels like home. For more information contact the City’s Local History Librarian on 9474 0800. Sadly I advise that Mrs Yurleen Dorothy Winmar, local Elder and native title holder, died on Sunday 17 November. Dorothy was the winner of the 2011 NAIDOC female elder award. Her focus was on her cultural heritage and connection to Perth and Derbarl Yerrigan as a proud Wadjuk Nyoongar. Over 15 years she conducted numerous guided cultural heritage tours and had extensive experience in developing cultural awareness training packages. She worked with the Prisons Visitors Scheme for 30 years, and was a lifetime member of the Derbarl Yerrigan Aboriginal Health Service, she was a qualified health worker and was the founder of the Moorditj Keila Aboriginal Group (excerpt from NAIDOC Award Profile). 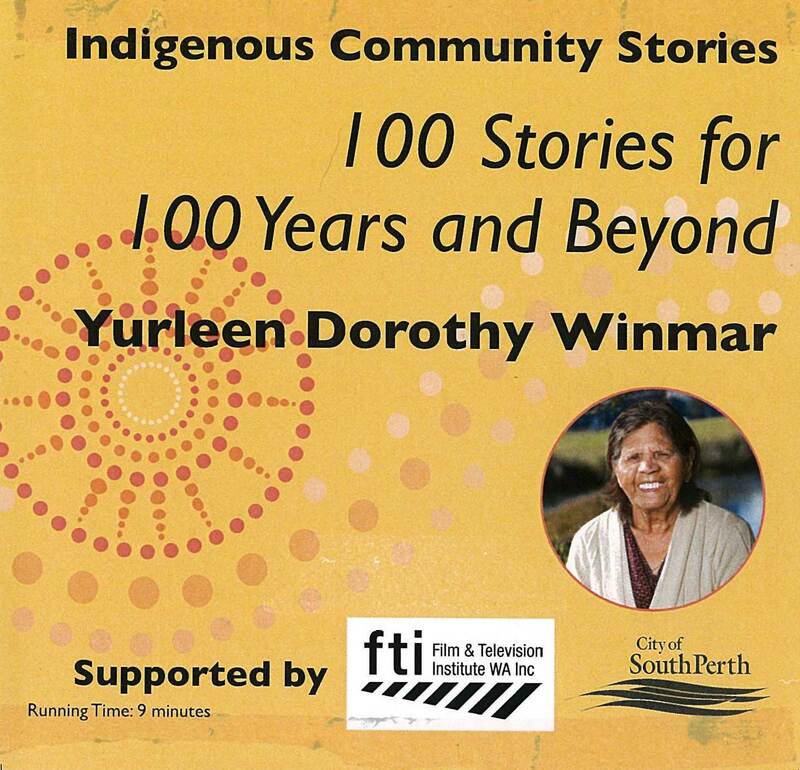 The City in conjunction with the WA Film and Television Institute was recently able to capture some of Dorothy’s stories in an oral history filming project, and this is available in the City’s libraries for viewing. The South Perth & Manning Libraries each have a copy of the DVD recording of Dorothy’s stories available for loan, they can be found in the “BIO” section in the Adult Non-fiction area of the DVD collections at both libraries. Please ask staff for assistance locating or reserving a copy. The oral history project was recorded last year as part of the WA Film and Television Institute’s Indigenous Community Stories initiative to record Western Australia’s Indigenous heritage, cultural and historical stories. The initiative aims to record 100 Indigenous oral histories, so they can be viewed by future generations as well as creating invaluable records of Australia’s national cultural identity. Are you celebrating National Family History Week? South Perth Libraries are! Toying with the idea of beginning your family history? Keen to understand those databases you see advertised on TV that might provide some awesome leads in your research? Or do you just want to know how to utilise some of these whiz-bang electronics to preserve your special photographs and documents? There are some fantastic free workshops if you would like to learn a little about these things, or perhaps you just feel like getting historically enlightened! 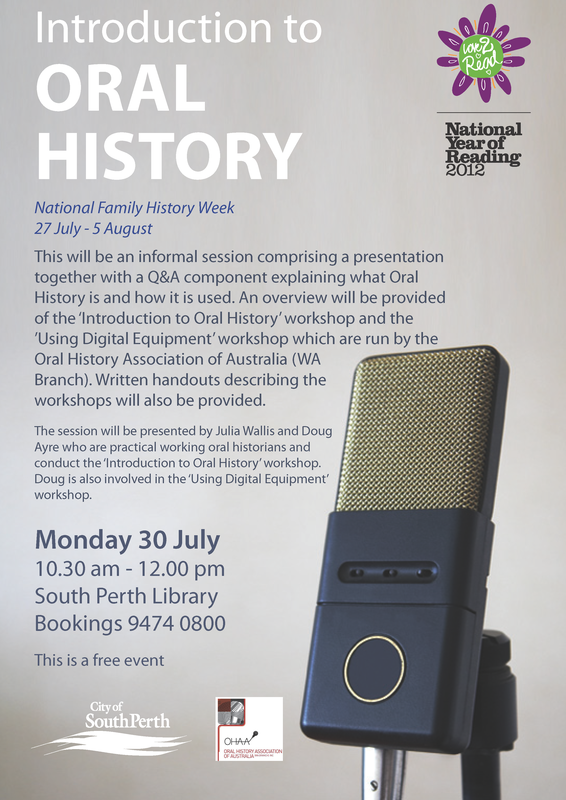 Check out WA’s National Family History Week events and South Perth Library’s Introduction to Oral History presentation! Have a Local History Question?